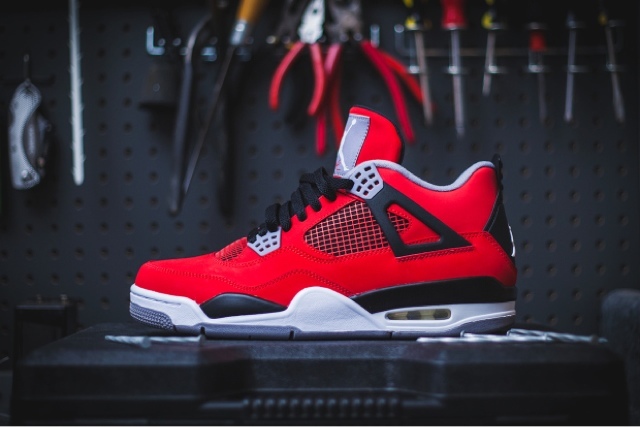 Air Jordan 4 Retro - Fire Red/Cement Grey "Toro Bravo"
One of the most talked about and anticipated colorways of the Air Jordan 4 Retro, unofficially dubbed “Toro Bravo,” is finally getting ready to drop at retailers. Featuring a red nubuck upper with cement grey and black accents and a white midsole, this is a bold look for the Air Jordan 4 Retro silhouette. A grey tongue with white Jumpman logo, grey lining and black heel tab round out the details of this incredible looking colorway. This latest colorway of the Jordan 4 Retro will be available at select retailers including Atlanta’s Wishstarting July 13 with a retail price of $160 USD.